Ford proudly owns its F-Series trucks which have been best selling trucks in the US and Canada for more than three decades. However, when GM presented all-new Chevy Silverado and GMC Sierra for 2014 model year, Ford known in that moment that it was time for serious rethinking and rebuilding. The product of that was certainly the most revolutionary redesign in truck industry ever, presented in all new 2015 Ford F-150. This model debuted with high-strength-steel frame, aluminum body, new engines and upgraded interiors. The same treatment was expected for Super Duty series and this strategy will be implemented for 2017 model year. However, Ford hinted in what direction the redesign of these models will go at 2013 Detroit Auto Show where it presented the Ford Atlas Concept model. Ford said back then that, Atlas Concept “is the future vision for pickup trucks” and indeed, the latter time had proved that this Concept model had pictured the future design chapter. This model showcased the design, smart technologies, and capabilities which latter have mostly been implemented in the new Ford-150. The exterior design of the Ford Atlas Concept model was certainly contemporary and promising. The most notable features are unique grille design, modern Led headlights, beefy fenders, attractive wheels, etc. However, not only that these components look attractive some of them also have more substantial purpose than for aesthetics. In that context, the grille design includes active shutters which help this model to improve fuel economy and some other aspects like aerodynamics. When truck needs better airflow for engine cooling the shutters behind the grille will be opened but for better aerodynamics and under lighter loads and around town when large amount of cooling air isn’t needed they will close automatically. The grille design is complemented with attractive LED based headlights which look great but also provide better visibility and last longer. Bellow is nicely designed bumper which include sharp fog lights and nice center opening while bellow it is drop-down air dam. Another cool feature of this concept model was seen on its wheels which include wheel shutters that are positioned behind the spokes and driven by self-recharging batteries. At low speeds these shutters are opened but at highway speeds they are closed automatically for better aerodynamics. Aside from those more functional stuffs is included in exterior portion like several tie-down points, cargo box LED lighting and 110 volt outlet, roof carrier, tailgate step, hidden cargo ramps, power running boards and so on. Inside, Atlas Concept has also presented modern design packed with advanced features. The Ford also putted innovative, lightweight seats inside which provide better comfort and allow more space for the rear seating row. The dashboard also looks modern and includes large and easy to use controls and it is trimmed with metallic accents and contrasting stitching. This model also promoted many advanced systems like Dynamic Hitch Assist, Trailer Backup Assist, 360-degree camera system, etc. Other features included in this model are intelligent door and tailgate unlock, push-button start, forward collision warning, blind-spot system, lane keeping assist and lane departure warning and so on. In the engine department, the Ford Atlas Concept model has placed the new generation twin-turbo EcoBoost engine. It is a 3.5 liter V-6 displacement equipped with enhanced Auto Stop-Start technology which should improve fuel efficiency. Other fuel saving systems like direct fuel injection, turbocharging, and active grille shutters were considered to bring projected 20 percent improved fuel economy and for 15 percent reduced emissions and all compared to then used larger engines. However, Ford didn’t specify engine capabilities at that time but latter the V-6 EcoBoost engine that has been offered with redesigned 2015 F-150 is capable for 365 hp and 420 lb-ft of torque. On the other hands its fuel economy is rated at 20 mpg combined. What is also important to mention the Atlas Concept model also highlighted the use of high-strength steel in body construction which latter will extensively be used in the new generation of Ford’s trucks. 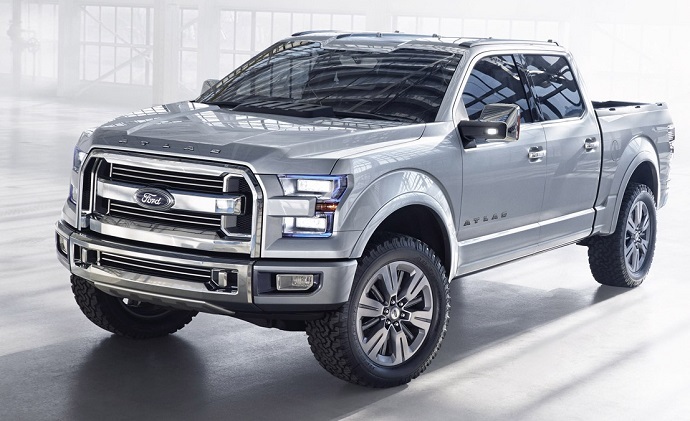 At the end, it can be said that the Ford Atlas Concept was great preview of the thirteenth generation of the F-150 model. This model has brought revolution in truck segment with aluminum made body, high strength steel chassis, frugal EcoBoost engines, advanced infotainment and safety systems and so on.